The Mission is a 1986 British drama film about the experiences of a Jesuit missionary in 18th century South America. Written by Robert Bolt and directed by Roland Joffé, the film stars Robert De Niro, Jeremy Irons, Ray McAnally, Aidan Quinn, Cherie Lunghi, and Liam Neeson. It won the Palme d'Or and the Academy Award for Best Cinematography. In April 2007, it was elected number one on the Church Times' Top 50 Religious Films list. Furthermore, it is one of fifteen films listed in the category "Religion" on the Vatican film list. The music, scored by Italian composer Ennio Morricone, ranked 1st on the Australian Broadcasting Corporation's (ABC) Classic 100 Music in the Movies. Despite mixed to positive reviews from critics, the film (along with Absolute Beginners) bombed at the box office and caused the deterioration of Goldcrest Films. The film is set in the 1740s and involves Spanish Jesuit priest Father Gabriel (Jeremy Irons) who enters the northeastern Argentina and western Paraguayan jungle to build a mission station and convert a Guaraní community to Christianity. 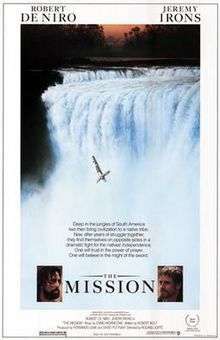 The Guaraní community is not initially receptive to Christianity or outsiders in general, shown by the opening scene where they tie a priest to a wooden cross and send him over the Iguazu Falls, a large waterfall they live above. Father Gabriel travels to the falls, climbs to the top, and plays his oboe. The Guaraní warriors, captivated by the music, allow him to live. Mercenary and slaver Rodrigo Mendoza (Robert De Niro) makes his living kidnapping natives such as the Guarani community and selling them to nearby plantations, including the plantation of the Spanish Governor Don Cabeza (Chuck Low). After returning from another kidnapping trip Mendoza is told by his assumed fiancée, Carlotta (Cherie Lunghi), that she loves his younger half-brother Felipe (Aidan Quinn). Mendoza later finds them in bed together and in a fit of rage kills Felipe in a duel. Although he is acquitted of the killing by Cabeza, Mendoza spirals into depression and seeks absolution for his actions. Father Gabriel visits and challenges Mendoza to undertake a suitable penance. Mendoza accompanies the Jesuits on their return to the Guaraní village, scaling a cliff while dragging a heavy bundle containing his armour and sword. Upon reaching the outskirts of the natives' territory, there are a few tense moments when the natives recognise him, but after seeing him in his humbled state, they cut away his heavy bundle and forgive him. Father Gabriel's mission is depicted as a place of sanctuary and education for the Guaraní. Moved by the Guaraní's acceptance, Mendoza wishes to help at the mission and Father Gabriel gives him a Bible. In time, Mendoza takes vows and becomes a Jesuit under Father Gabriel and his colleague Father Fielding (Liam Neeson). The Jesuit missions were safe because they were protected under Spanish law. The Treaty of Madrid (1750) reapportioned South American land the Jesuit missions were located on, transferring the area to the Portuguese who allowed slavery. The Portuguese colonials seek to enslave the natives, and as the independent Jesuit missions might impede this, Papal emissary Cardinal Altamirano (Ray McAnally), a former Jesuit priest himself, is sent from the Vatican to survey the missions and decide which, if any, should be allowed to remain. Under pressure from both Cabeza and Portuguese Governor Don Hontar (Ronald Pickup), Cardinal Altamirano is forced to choose between two evils. If he rules in favour of the colonists, the indigenous peoples will become enslaved; if he rules in favour of the missions, the entire Jesuit Order may be condemned by the Portuguese and the European Catholic Church could fracture. Altamirano visits the missions and is amazed at their industry and success, both in converting the Indians and, in some cases, economically. At Father Gabriel's mission of San Carlos he tries to explain the reasons behind closing the mission and instructs the Guaraní that they must leave because it is God's will. The Guaraní question the validity of his claim, and argue God's will was to settle and develop the mission. Father Gabriel and Mendoza, under threat of excommunication, state their intention to defend the mission alongside the Guaraní if the plantation owners and colonists attack. They are, however, divided on how to do this, and they debate how to respond to the impending military attack. Father Gabriel believes that violence is a direct crime against God. Mendoza, however, decides to break his vows to militarily defend the Mission. Against Father Gabriel's wishes, he teaches the natives the European art of war and once more takes up his sword. When a joint Portuguese and Spanish force attack, the mission is initially defended by Mendoza, Fielding and the Guaraní. They are no match for the military force and Mendoza is shot and fatally wounded after the soldiers destroy a trap, allowing them to enter the village. Fielding sacrifices himself by killing the Portuguese commander before he is killed. Upon seeing the Church at the mission village the soldiers become reluctant to fire. When the soldiers enter the mission village, they encounter the singing of Father Gabriel and the Guaraní women and children who march in the procession. Fr. Gabriel leads carrying a monstrance with the Blessed Sacrament. In spite of this, the Spanish commander orders the attack and Father Gabriel, the rest of the priests and most of the Guaraní, including women and children, are gunned down. After Fr. Gabriel is shot, a child picks up the Blessed Sacrament and leads the procession. Only a handful escape into the jungle. In a final exchange between Cardinal Altamirano and Don Hontar, Hontar laments that what happened was unfortunate but inevitable because "we must work in the world; the world is thus." Altamirano replies, "No, thus have we made the world. Thus have I made it." Days later, a canoe of young children return to the scene of the Mission massacre and salvage a few belongings. They set off up the river, going deeper into the jungle, with the thought that the events will remain in their memories. A final title declares that many priests continue to fight for the rights of indigenous people. The text of John 1:5 is displayed: "The light shineth in the darkness, and the darkness hath not overcome it." The Mission is based on events surrounding the Treaty of Madrid in 1750, in which Spain ceded part of Jesuit Paraguay to Portugal. A significant subtext is the impending Suppression of the Jesuits, of which Father Gabriel is warned by the film's narrator, Cardinal Altamirano, who was once himself a Jesuit. Altamirano, speaking in hindsight in 1758, corresponds to the actual Andalusian Jesuit Father Luis Altamirano, who was sent by Jesuit Superior General Ignacio Visconti to Paraguay in 1752 to transfer territory from Spain to Portugal. He oversaw the transfer of seven missions south and east of the Río Uruguay, that had been settled by Guaranis and Jesuits in the 17th century. As compensation, Spain promised each mission 4,000 pesos, or fewer than 1 peso for each of the circa 30,000 Guaranis of the seven missions, while the cultivated lands, livestock, and buildings were estimated to be worth 7–16 million pesos. The film's climax is the Guarani War of 1754–1756, during which historical Guaranís defended their homes against Spanish-Portuguese forces implementing the Treaty of Madrid. For the film, a re-creation was made of one of the seven missions, São Miguel das Missões. Father Gabriel's character is loosely based on the life of Paraguayan saint and Jesuit Roque González de Santa Cruz. The story is taken from the book The Lost Cities of Paraguay by Father C. J. McNaspy, S.J., who was also a consultant on the film. The waterfall setting of the film suggests the combination of these events with the story of older missions, founded between 1610–1630 on the Paranapanema River above the Guaíra Falls, from which Paulista slave raids forced Guaranís and Jesuits to flee in 1631. The battle at the end of the film evokes the eight-day Battle of Mbororé in 1641, a battle fought on land as well as in boats on rivers, in which the Jesuit-organized, firearm-equipped Guaraní forces stopped the Paulista raiders. The fictional characters Gabriel and Rodrigo were involved in a struggle that is factually incorrect since it was only the Guarani who fought against oppression in the resulting three-year warfare against the Portuguese. The Jesuit missionaries did not directly disobey the orders of Altamirano, and none stayed to fight with their converts. The character of Altamirano is also historically inaccurate. He was not a cardinal sent by the Pope but an emissary sent by the Superior General of the Society of Jesus, Ignazio Visconti, to preserve the Jesuits in Europe in the face of attacks in Spain and Portugal. The film was mostly filmed in Colombia, Argentina, Brazil, and Paraguay. The tunnels of Fort Amherst in Kent were used as part of the monastery where Mendoza (Robert De Niro) is being held after he murders his brother. The Mission soundtrack was written by Ennio Morricone. Beginning with a liturgical piece (On Earth as It Is in Heaven) which becomes the "Spanish" theme, it moves quickly to the "Guaraní" theme, which is written in a heavily native style and uses several indigenous instruments. Later, Morricone defines the "Mission" theme as a duet between the "Spanish" and "Guaraní" themes. Other themes throughout the movie include the "Penance", "Conquest", and "Ave Maria Guaraní" themes. In the latter, a large choir of indigenous people sing a haunting rendition of "Ave Maria" in their native language. ↑ "The Mission (PG)". British Board of Film Classification. 30 July 1986. Retrieved 19 October 2016. ↑ "Puttnam bites back." Sunday Times [London, England] 22 Mar. 1987: 47. The Sunday Times Digital Archive. Web. 8 Apr. 2014. ↑ Sheila Benson (14 November 1986). "Movie Review : A Dilemma Of Conscience At Heart Of 'The Mission'". LA Times. Retrieved 8 December 2015. ↑ "Top 50 Religious Films - Ray Fowler .org". Retrieved 6 September 2016. ↑ SDG (2015). "The Mission (1986)". Decent Films. Steven D. Greydanus. Retrieved December 15, 2015. ↑ Canby Vincent (31 October 1986). "SCREEN: 'THE MISSION,' WITH DeNIRO AND IRONS". New York Times. Retrieved 8 December 2015. 1 2 James Schofield Saeger (1995) "The Mission and Historical Missions: Film and the Writing of History." The Americas, Vol. 51, No. 3, pp. 393–415. ↑ Saxon, Wolfgang (8 February 1995). "C. J. McNaspy, 79, Jesuit Musicologist, Author and Linguist". The New York Times. ↑ Kent Film Office. "Kent Film Office The Mission Film Focus". ↑ "The 59th Academy Awards (1987) Nominees and Winners". oscars.org. Retrieved 31 July 2011. ↑ "The 1987 Bafta Awards Nominees and Winners". bafta.org. Retrieved 23 January 2015. 1 2 "Festival de Cannes: The Mission". festival-cannes.com. Retrieved 11 July 2009. ↑ "1986 Golden Globes nominees and winners". hfpa.org. Retrieved 23 January 2015. ↑ "AFI's 100 Years of Film Scores" (PDF). American Film Institute. Retrieved 2016-08-14.